Colorado Says Aliens Must Go! Just north of the almost-Ghost Town of Hooper in Colorado's beautiful and weird San Luis Valley, there's a truly oddball roadside attraction known as the UFO Watchtower. Local rancher Judy Messoline opened the elevated viewing platform (and the required gift shop full of Flying Saucer trinkets & gewgaws) to capitalize on the valley's long history of bizarre aerial phenomena and the wave of UFO-conspiracy teevee shows in the 1990s. Nancy Shanks, a CDOT spokeswoman, said the state recognizes the need for directional signs for tourism. Blue signs with white lettering are available for that purpose. "The state law mirrors the national law on roadside beautification. These laws on roadside advertising are in place for very specific reasons, from highway safety, uniformity, maintenance and highway beautification," Shanks said. She said the Department of Transportation is making a special effort to remove illegal signs in southwest Colorado, where a new employee is taking a fresh look at the violations. In Messoline's case, the alien signs are on her property. She owns a section of land that is split by Colorado 17. The business is on the west; the signs are on the east. They are therefore illegal because they are not contiguous to the business. An 8-foot alien on the west side of the road is allowed because it's next to the business. "I feel it is harassment. I honestly feel it's harassment," Messoline said. "What they want us to do is buy the CDOT signs, the little blue signs with the arrow. Well, you can't even read them. They're $250 a year per sign." That's right, the signs in question are on the lady's own property. Jay Young, owner of the Colorado Alligator Farm, also on Colorado 17, estimates that 50 percent of visitors drop by because they have seen one of the attractions' signs on private property. "Our livelihood comes from those signs. Realistically, we can't survive without those signs," Young said. "I feel that it's encroaching on our freedom, our freedom of speech as well as our right to promote our tourist-oriented business," he says. "It's going to be hard for us to deal with." Even if the petty bureaucrats win this alien war, the tower will remain ... and you can rest assured that Messoline's UFO viewing platform will continue to be surrounded by myriad representations of the standard big-headed big-eyed alien in various shades of green and gray. 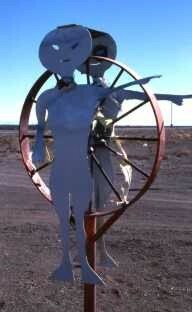 The UFO Watchtower is 2.5 miles north of Hooper on Colorado Highway 17. There are "primitive campsites" available, and summer usually sees some sort of crazy festival or another. If the Watchtower's not enough to bring you to the San Luis Valley — the largest alpine valley in the world — how about the Great Sand Dunes National Park & Preserve, the Nature Conservancy's majestic Medano-Zapata Ranch, the Cumbres & Toltec Scenic Railway (the longest narrow gauge railroad in North America) and the Sangre de Cristo and San Juan mountain ranges? Those interested in the paranormal will find much to see, too. Start by reading this two-part article from 1996, "The Mysterious San Luis Valley." If someone told you there was a single geographic region with indigenous legends telling of doorways used by star people piloting flying seed-pods, hundreds of UFO sightings, the first publicized unusual animal death case, waves of cattle mutilations, bigfoot encounters, alien abductions, rumors of secret underground bases and the world's most unusual sand-dune desert, would you believe them? And if they told you a large phantom fire was recently reported in this area to local sheriffs by NORAD during a (still continuing) "UFO sighting flap," or that it was a place where various localized spook lights lurk up the road from towns where a legendary devil makes occasional appearances, all within sight of privately owned 14,000-foot mountains, would you believe such a place existed? Welcome to south-central Colorado and north-central New Mexico's San Luis Valley.